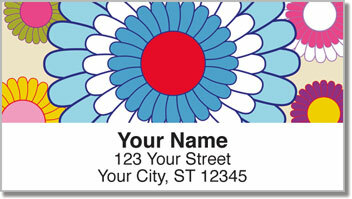 Brilliant blooms with a retro feel are featured on return address labels designed to make your mail super cool! The multi-colored flowers include a little bit of hippie chic, a little psychedelic style and a whole lot of fun-loving personality! Get lost in this far out floral print and turn every envelope into an eye-popping work of art! 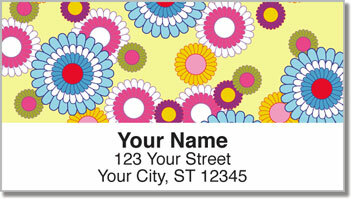 Flashback Flower Address Labels from CheckAdvantage are not only cute...they're also quite convenient. 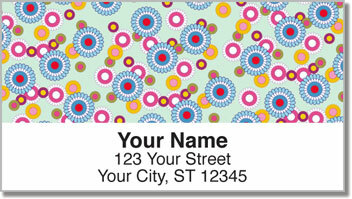 A self-adhesive backing allows you to simply stick them on all your outgoing mail. That eliminates the annoying step of filling out your name and address by hand. Pretty groovy, huh? 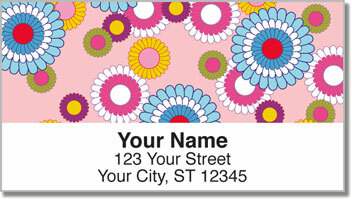 Order your own Flashback Flower Address Labels right now! This selection can also be found as matching personal checks.